I landed this 760g Threadfin(above) while Ah Boi(below) caught another 720g just half an hour later. But we used difference bait. I using dead tamban while he used fresh squid. Heard there is another threadfin was caught later in the night. 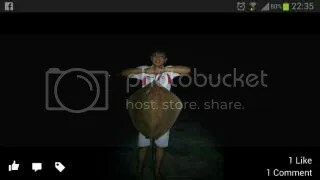 Caught the 3kg stingray around 8.30pm when the tide is about to full. It take the bait and cause my reel alarm go screaming. I pickup and strike…fish on…but small size…Easily i wind back..but i didn’t use my rod to lift it up….Instead…I ask ah Boi to take his gaff to gaff it…As he is new and never try before…I let him practice how to gaff a fish..He got it on the second try but is no forcefull enough as the gaff didn’t sink in deep. Lucky the fish is no big…otherwise might have some difficulty of bringing it up. Ah Boi packup around 9pm…I choose to stay until 10pm…He wind back but his squid bait was still nicely on the hook. I told him to pass it to me so that I can use on my next bait change. 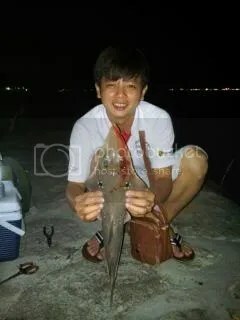 Around 10pm….I decided to packup….While I was keeping my squid net…suddenly I heard my reel screech…I went to strike…Yes…another hookup….I thought it was a marine catfish while I winding it back…but it turn out to be a small threadfin when I lift it out from the water..